One thing you may notice about me is that I'm a picture person. =) I really enjoy taking and sharing pictures. Sorry if this post is a bit too long, but I wanted to share special memories from my 18th birthday. The day started early, as we had a lot to do. I arose at 6 a.m., showered, and had devotions on the swing, then started working full swing. There were rooms to clean, food to make, and things to decorate. It was fun, but all a'flurry! Everyone was very kind to help out, and things were thankfully done in time. 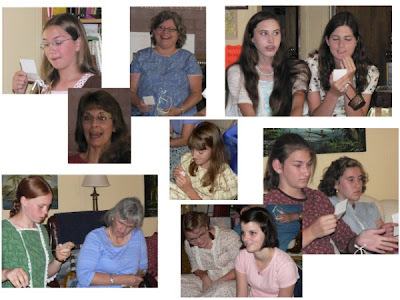 The theme of the party was "Women of Noble Character". People started arriving around 11 a.m. and we had the party centered on women from the Bible and passages specifically relating to womanhood. When I thought about who to invite, several families started coming to mind, ones we'd known for years and who have really been influential in shaping who I am. I knew that I wanted to include the mothers, and when I got to thinking, I realized that although I don't have that many friends around my own age, I have many pretty close friends that are 5, 8, 12, or so on! 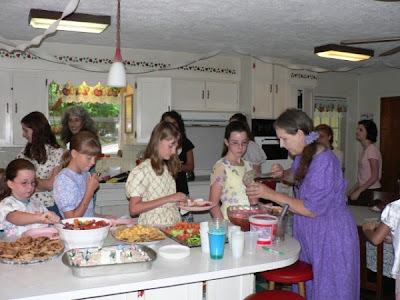 So, we invited all the ladies of each family, and had a great time together! There were 33 of us together - quite a houseful! I enjoyed finding and buying things to decorate with, things that were truly "me". Most of the decorations were pink, white, and roses, lacy and feminine! 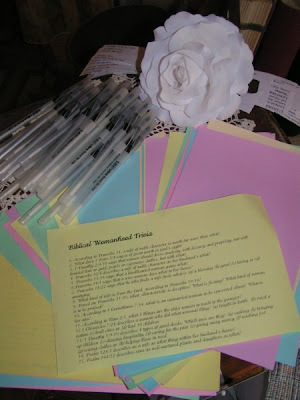 I made a collage using the Proverbs 31 Maidens pictures we'd taken last year, and this table was where everyone added the letters I'd asked them to bring instead of gifts to help compile a notebook on Biblical Womanhood. More about the notebook in a later post! Little touches of roses and scrapbooks brightened up a corner. 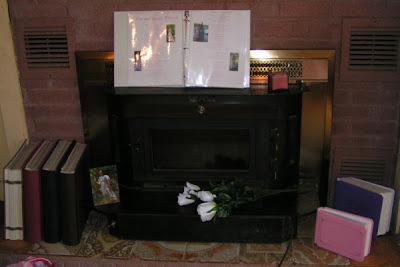 I also put my book of poetry up, opened to the poem "A True and Godly Woman", which is still my prayer today. These lovely candle holders were given me for my graduation, and I used pastel ribbon I'd bought and, again, a lovely white rose for the main table. The other table had a candle and small touches of pink and roses as well. For the party favors, I put candy and a small fake rosebud in a little basket tied with a bow matching the rose bud, and holding a Woman of the Bible card for the first game we played. I'd been eying these cute little baskets for quite a while at the Dollar Tree, but couldn't come up with a valid excuse for me to buy some until now. At 3/$1, they were a good buy! 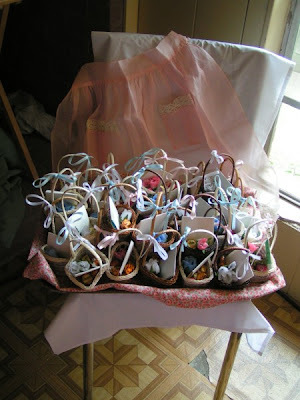 I had fun making all the little baskets, though it took some time. I get some much joy out of making even just little things beautiful! The apron used to decorate the background was my grandmother's. My cake, which I made on Friday, was our favorite chocolate oatmeal cake recipe, frosted with creamy butter frosting flavored with peppermint extract. Fake rosebuds made it look beautiful! 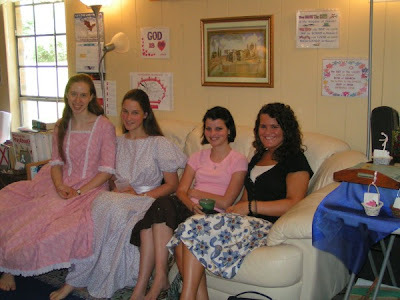 I wore my pink colonial dress, since it is my favorite color! 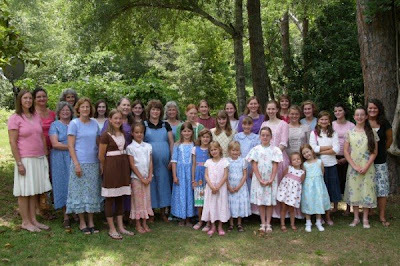 I'd invited each lady to come dressed "as elegantly as they wished", since it's always fun to have an excuse to dress up. 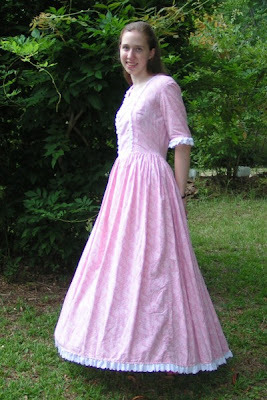 I also wore a small hoop skirt, which made me feel like I was floating from room to room. Miriam Lofgren surprised everyone by wearing one of my dresses, one that's not usually exactly her taste. =) She looked lovely, though! After everyone arrived, we played our first game, Women of the Bible Taboo. 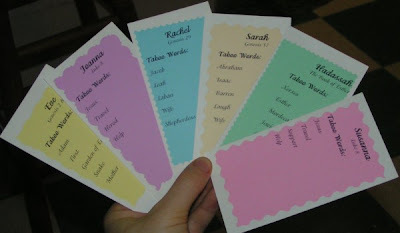 I made cards for each person, with the name of a woman from the Bible, a reference to look them up if they didn't know the story, and a list of taboo words that they couldn't say when describing them. We went around the room, and everyone tried to describe their woman, while everyone else tried to guess. Some were rather easy, others a little harder. It's always fun to watch peoples' faces as they try to describe or guess! Everyone enjoyed fellowshipping with friends, some of whom we hadn't seen in quite a while! After everyone had finished lunch and we'd enjoyed some cake, we played another game I'd made up: Biblical Womanhood Trivia. I soon learned that I'd made everything way too hard - I should have had more multiple choice or fill-in-the-blank questions! However, everyone did the best they could! We had prizes of stationery packs for whoever got the most questions right in 4 different age groups. Then we played a most unique birthday party game, one that my sister Miriam came up with! We addressed her wedding invitations. Yes, truly! :-) She's been really busy, and just left to go on a short-terms trip to Peru, and really needed to get things addressed before she left. So, we had an "elegant writing contest" where each person addressed 5 or more invitations, chose the one with their best handwriting, and submitted it to be judged. After thinking long and hard, John chose the winning envelope, and the writer got a pack of pretty gel pens. It was fun to address things together, and it went really quickly with so many helping, though we later had to check the envelopes and make sure they were done right. 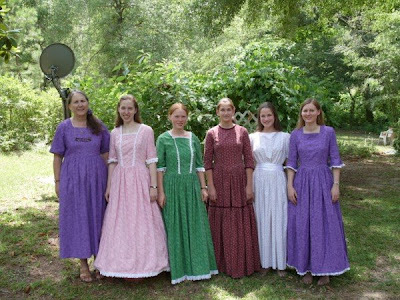 Quite a few people wore clothes I'd made, so we took a picture together. Miriam Hart changed into my graduation dress when she arrived, and Esther Hart changed into my pioneer dress. 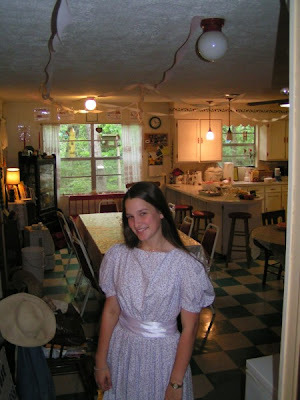 Miriam Lofgren wore my purple dress, that's made using the same pattern as the colonial ones. It's nice that others could enjoy my dresses, since I have a lot and can't wear them all at once! Mom and Jubilee each wore ones I'd made for them. It's still hard for me to believe that I'm 18 years old. The past few years have flown by, and sometimes I wonder how I got to be so "old". However, I'm very thankful for the years of life God has given me, and look forward to the years ahead, though they will be full of changes. I pray that each day I will live my life as His maiden, concerned about the Lord's affairs, and devoted to Him in both body and spirit. What lovely pictures. Not as good as being there in person, but it will do! I thought Miriam was wearing your graduation dress! You truly made everything feminine; that is so you!! I am so happy that your day was blessed! It looks like y'all had a wonderful time! I had a tea last year for my 16th birthday, and this year for my 17th I had a theme similar to yours; we talked about Biblical womanhood, exchanged prayer requests, and so on. It is such a blessing to share thoughts and fellowship with like-minded Christian ladies. Happy (belated) Birthday! Many blessings to you! I forgot to say that I love your pink dress! Soon after I first found your blog, I went to Wal-Mart, bought that pattern, and made the dress myself! Sounds like a lovely party, Anna, and so very you! I am still laughing at Miriam's wedding invitation game. I have a feeling that story will become part of a long and happy marriage. Ella: Wish you could have been there too! Having you and Jen there would have made it perfect. Oh well, maybe sometime! Tiffany: I really enjoy comments even by people I don't know. =) Thanks for taking the time to leave them! 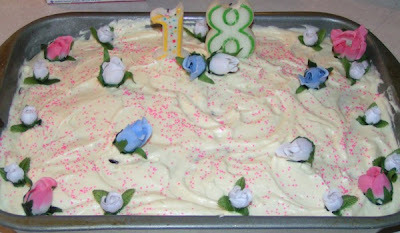 You 16th and 17th birthday parties sound like they were special. This is the first big party I've had in the past few years - the last two years I've been away from home for my birthday, and this year the special day actually landed perfectly on a Saturday! Glad you made one of those dresses - they're a lot of fun to wear! Maria Pauline: Hmm... let's see. Using the same pattern, Simplicity 5041, I've made the pink dress I wore, the purple dress Miriam wore plus a matching pink dress for my "twin" Jennifer in Nebraska, the green dress Jubilee wore, and a green Christmas dress for myself. 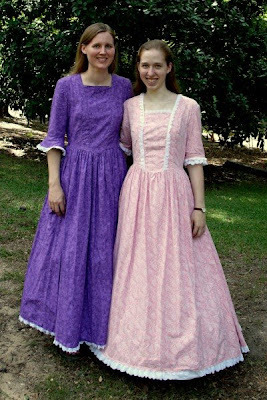 I've also made 3 pioneer dresses like the one Esther wore (for me, mom, and Jubilee) using a different pattern. Happy Birthday! It looks like you had a fun party with a purpose. What a great time! I love all the pictures. You were all really creative with your games! I am sure everyone had a great time! Congratulations Anna! It looks like it was so much fun. Maybe I will do a theme party when I have my sleepover...I will also be turning 18 this year. Where does the time go???? Anyways, thank you for sharing the pictures of your lovely party. It looked like you all had a fun time while still having a biblical focus. Pink is a great colour for a dress! The purple one is good too. 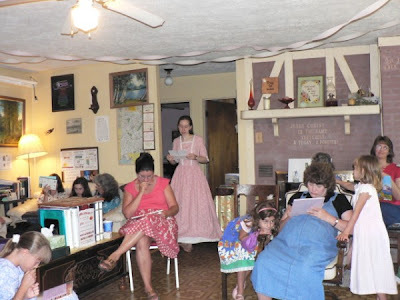 Was wondering if you were still thinking of filming the reading of "A True and Godly Woman" poem? 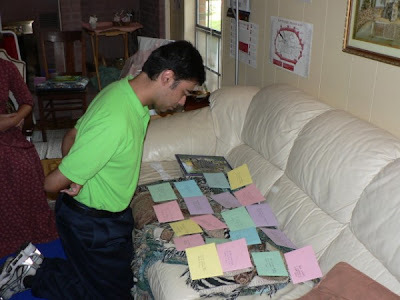 The invitation game was a fun way to get people to help with the wedding planning.